I must admit that, before I started Theology classes at Liberty University, I held a dim view of theologians. They seemed to be a dusty, old, out of touch group of men from a time that held no relevance to me. What could they possibly know about life now, in this age, with the current problems that face us? It was, as I came to find out, a short sighted, incorrect view of some of God’s most willing and able disciples. 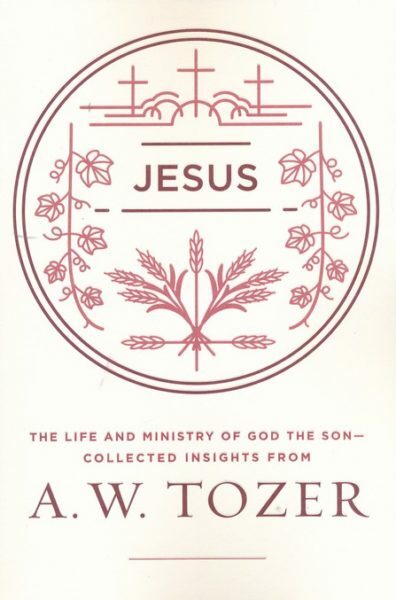 I recently received Jesus by A. W. Tozer from Moody Publishing. You can imagine my thoughts (insert teenage type eye roll here) as I opened the box and pulled out the simple, unadorned book by someone who was high on my list of “please don’t make me read that” authors. I vaguely recalled putting it into my request box simply because I was taking a theology class and I needed more sources for my research papers. But to actually need to read it and review it? Oh bother as Eeyore would way. A. W. Tozer was born in 1897. An uneducated man, he accepted Christ as a teenager after hearing a street preacher. After that monumental change in his life, he embarked on a path of self education that led to his becoming one of the most prolific theological writers of his time, with over 60 books to his credit. He became a pastor, serving for over 40 years, all with no theology degree or even any formal education past grammar school. Yet, to say he shaped Christianity in a profound way, doesn’t even begin to scratch the surface of his life. This book arrived at a particularly chaotic time in the life of sweetheart and I. Job changes, a loss of income, a house to sell, graduations to attend, a child in rehab, a semester when I had chosen to take 18 credits of college classes. The book was immediately tossed onto my bedside table where it sat, balefully looking at me every night when I went to bed. “I will get to it Lord” I would mutter under my breath, watching the calendar for my deadline for reviews, praying some miracle of extra time would occur before the date arrived. And, as He always does, God showed up and time arrived in the form of living alone in a 45 ft class A diesel pusher motor home in the outskirts of a tiny town in Texas where it is 30 minutes to the nearest grocery store. As I lay on the bed in the quietness I haven’t had in many, many, many years (think living next to an interstate for the last 7 years), I reached for the thin volume and began to read. Too soon, tears began to flow as the words of wisdom washed over my heart, filling me with increased understanding about the only man who truly loves me unconditionally. Jesus. Jesus Christ, my Lord and Savior. Jesus who died that I might live, free from the ravages of sin and pain. Jesus is a collection of insights from Tozer. Taken from the various books and sermons that he wrote and gavejesus1 over the years, it is profoundly intimate in it’s plea for the reader to understand the importance of just Jesus. No religion, no works of man, nothing but the love and grace that falls fresh upon you when you receive Him. As I have found myself reading and re-reading the words of this great man, I have felt my heart open just a little more to an acceptance that as much as things change, they all remain the same. Indeed, Tozer says in the book “I confess a sadness about the shallowness of Christian thinking in our day” (pg 10). Do we not see and hear that almost daily, from blogs and podcasts and sermons? How shallow Christians are? Yet, we can not fail to see that it has always been so, even as far back as recorded history. This book, this collection of words to remind us that we can only see the real Jesus when we give our lives to Him fully, should take it’s rightful place in every believers home. Just a few sentences here and there, a quick read through a chapter such as “Creator, Sustainer, Benefactor” or The People’s Savior” will help remind you that religion is not the answer. Jesus is. To every question we have. This collection of writings by Tozer focus specifically on God the Son, reminding us that, in Him, we find our very reason for being. Click HERE to get this amazing book.